Blizzard hits the Pelham Park section of the Bronx. I was 9 the last time a New York City mayor was so roundly condemned for a lousy snow job. My family lived in Rego Park, Queens, in February of ’69, and my parents let us kids stay up late with our noses pressed perilously against the (now illegally) un-gated window of our 14th-floor living room as the snow came down. By morning, 20 inches had buried our "outer borough." There were lots of red faces over the cold, hard fact that no one had predicted the extent of the storm. As I remember it, the weathermen (and back then, they were all men on local TV) so completely miscalculated that all the salt-spreaders and snowplows were nestled all snug in their garages. 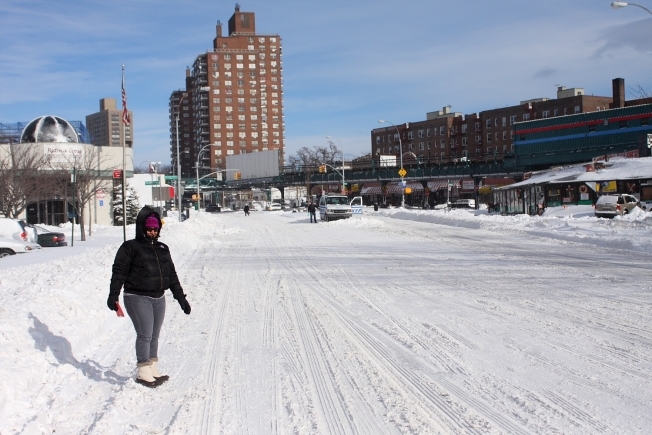 By morning, Queens was paralyzed under what looked like mountains of snow to my young eyes. About 20 people died — a sad precedent for today, when several deaths are attributable to emergency personnel being unable to negotiate snow-glutted streets. Even so, those days of frozen wonder still warm my heart. With our mom as our guide, my two sisters and I were deployed with our red snow saucer to Waldbaum’s supermarket to purchase a quart of milk apiece (that was the official limit), a package of American cheese, and as many cans of SpaghettiOs as we could carry. Bundled up in parkas, snow pants, hats, scarves and gloves, we looked like the Michelin Man’s family. And it was all to little avail: By the time we got to the store, the shelves were swept so clean we could have been in Moscow with my grandparents during their greatest deprivations. Meanwhile, the urchin kids of the Anita Apartments gleefully built snow forts, launched spontaneous snowball fights, and fueled ourselves with hot chocolate and melting marshmallows. We slid around the vacant schoolyard, making snow angels in the middle of normally gridlocked 63rd Road. We carefully steered clear of yellow snow and frozen doggie treats until our hands were frozen and our noses were drippy faucets. For days on end, we happily ignored broadcasts imploring students to practice their multiplication tables and spelling, and instead got to watch “Speed Racer” and soap operas, undeterred by increasingly irritated parents. Now, four decades later, I’m watching this latest snowstorm fallout from afar — 3,000 miles from Apartment 14G. I’d probably be one of those angry adults today if I were there. But instead I’m in Los Angeles, my garage door swollen and broken from nonstop rain, one wall stuffed with old towels to stanch an untraceable leak. I know I’m lucky, very lucky. But I can’t help but miss the blizzard of my youth.